On April 11, 2019, the American space company SpaceX launched its second Falcon Heavy rocket, and this time, landed all three boosters successfully. SpaceX successfully launched the Falcon Heavy rocket on its first commercial flight, deploying a Saudi telecommunications satellite. Last year, the company has launched the 1st Falcon Heavy, a partially reusable heavy-lift launch vehicle designed and manufactured by SpaceX, which has the highest payload capacity of any currently operational launch vehicle. It was a test flight, and the mega-rocket delivered a Tesla sports car into space as a dummy test payload. Falcon Heavy is derived from the Falcon 9 vehicle and consists of a strengthened Falcon 9 first stage as a central core with two additional first stages as strap-on boosters. At the first test flight last year, on February 6, 2018, Falcon Heavy’s side boosters landed safely on Landing Zones 1 and 2 a few minutes later. However, only one of the three engines on the center booster that were intended to restart ignited during its descent, causing it to hit the water next to the drone-ship at a speed of over 480 km/h (300 mph). This time, eight minutes after liftoff, SpaceX landed two of the first-stage boosters back at Cape Canaveral, side by side, just like it did for the rocket’s debut last year. Two minutes later, the core booster landed on “Of Course I Still Love You” droneship, which was stationed in the Atlantic Ocean. That was the only part of the first mission that missed. All these boosters now can be re-used in future launches. 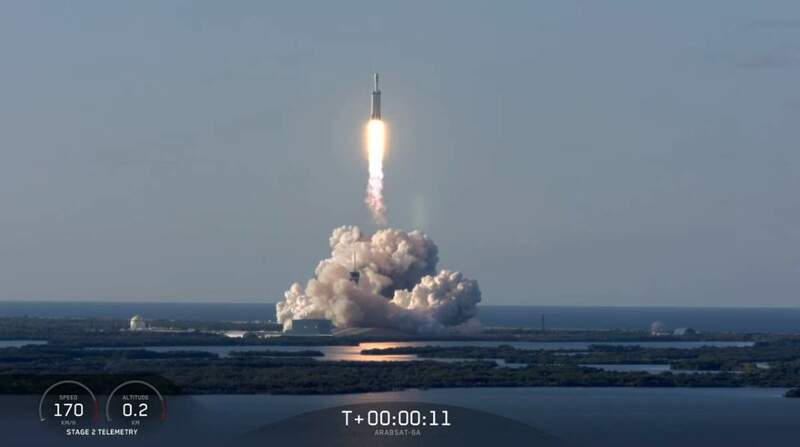 On April 11, 2019, SpaceX successfully launched a Falcon Heavy rocket, the partially reusable heavy-lift launch vehicle’s second flight, and its first commercial launch. The mission deployed Arabsat-6A, a Saudi Arabian communications satellite into orbit. This was not a test flight: the new and improved Falcon Heavy successfully launched Arabsat-6A, a Saudi Arabian communications satellite and released it into orbit. Arabsat-6A will be positioned in geostationary orbit providing television, internet, telephone, and secure communications to customers in the Middle East, Africa, and Europe. All three boosters of the Falcon Heavy rocket that launched the Arabsat-6A mission landed safely. Two landed on the ground in Florida and one on the droneship “Of course I still love you” in the Atlantic Ocean.